Where Are the Best Margaritas in Santa Fe? When you come to Santa Fe, you know that you’ll get to indulge in the amazing cuisine the city offers. With a restaurant around every corner, it’s hard to choose which to visit. Plus, you can’t forget about the drinks! The go-to drink in New Mexico is the classic margarita. So, where can you find the best margaritas in Santa Fe? You wouldn’t believe how many margarita combinations there are until you visit some of these restaurants! If you’re looking for variety in your margaritas, look no further than Maria’s New Mexican Kitchen. What started out as a small take-out kitchen is now one of the most popular spots to grab a bite to eat. Plus, it has over 100 varieties of margaritas! With variety like this, you’re sure to find one that you’ll enjoy. If you don’t know what to choose, just ask your waiter or bartender their favorite. Make sure you get to The Shed Creative Cooking as early as possible; it’s a popular spot and fills up fast! This restaurant has been serving Southwestern fare since 1953. Enjoy dishes like their signature red chile enchiladas, tacos, and more. Plus, they have an extensive drink menu! Each margarita is made with 100% blue agave and includes their house-made fresh margarita mix. For an upscale eatery serving some of the best margaritas in Santa Fe, visit Coyote Cafe & Rooftop Cantina. The restaurant is divided into two parts: the cafe is more upscale while the cantina is more casual. You’ll love the view from the roof, and the Green Chile Margarita is a favorite! When you visit Gabriel’s, put in an order of tableside guacamole, then take your time with the drink menu. Their margaritas pair with the New Mexican cuisine brilliantly. In the summer, you can sip on your freshly-squeezed lime margarita with spectacular views of the Sangre de Cristo mountain range! 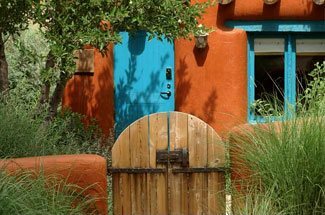 Stay at Four Kachinas for an authentic Santa Fe vacation! 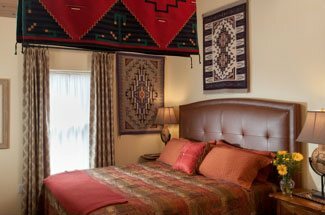 All our rooms are gorgeously decorated with Southwestern features. Choose your cozy room, then start planning your trip. Our comfortable bed and breakfast is in the heart of the city, so it’s near many places to get some of the best margaritas in Santa Fe! You’re so close to some that you could even walk. After your margarita tastings, come back to Four Kachinas and relax before waking up to a delicious homemade breakfast. Start planning your stay today!